If this was some kind of Hipster test then I'm sorry to say that I failed. 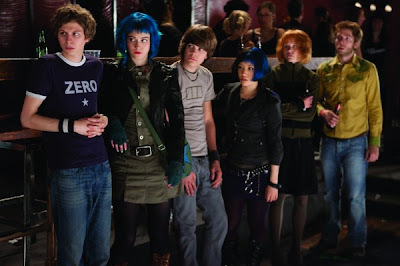 All the cool kids liked Scott Pilgrim and I kind of liked it too, until it really got really repetitive in the third act and the movie didn't know how to end. The actual end where he - spoiler alert - shrugged off the lessons he'd learned and went off with the wrong girl felt cheap. It's probably a generational thing. Maybe you have to be under 30 to like this movie, I don't know...Anyway, by default I'm a black cloud but today I want to leave you with the postive, so on the plus side we had: the performance of that weird McCulkin brother, Michael Cera's T shirts, the nice use of an actual phone number - none of that 555 crap - for Ramona (212 664 7665), the performance by that girl who played Knives and a nice plug for Goodwill Canada.